OK, this one is official! 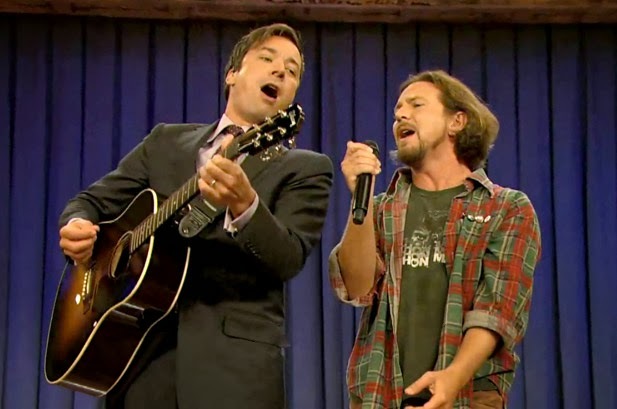 The week after next, October 21st through the 25th, is Pearl Jam Week on Late Night with Jimmy Fallon. Jimmy will be hosting Chris Cornell, Robin Pecknold (Fleet Foxes), and Dierks Bentley all covering Pearl Jam songs, and yes, the week will be finished off with TWO live performances by Pearl Jam. The official press release tells you more details which include all sorts of awesomeness! On Monday, October 21, Fallon welcomes Soundgarden frontman Chris Cornell to perform the song “Footsteps” with the Avett Brothers. The instrumental of this song previously appeared in a different form as the track "Times of Trouble" in the 1991 self-titled album by Temple Of The Dog, which featured Cornell collaborating with the members of Pearl Jam. Wednesday night, country music superstar Dierks Bentley will be joined by Pearl Jam lead guitarist Mike McCready and The Roots for a one-of-a-kind performance. Bentley previously covered "Wish You Were Here" as part of “Late Night's” Pink Floyd tribute week in 2011. His 2009 album "Feel That Fire" features a guest appearance by McCready on the song "Life on the Run." Pearl Jam closes out the week with performances on Thursday, October 24 and Friday, October 25.